Let’s just start by saying Bellevue knows how to get in the holiday spirit! If you’ve never spent an evening in Bellevue around Christmas, then you’re missing out. Tim and I love this time of year, which is why we jumped at the chance to go on a holiday date night in Bellevue. The night included ice skating, “snow,” a visit with whimsical holiday characters, a fun dinner and a stroll through a garden decked out with hundreds of thousands of Christmas lights. Without further ado, here is our latest installment of It’s a Date! Tim and I take a break from ice skating to strike a pose. 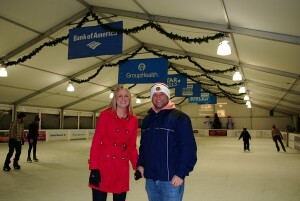 We started our holiday date night at the Bellevue Magic Season Ice Arena. Located in Bellevue Downtown Park (NE 1st St. & 102nd Ave NE), it’s the largest outdoor holiday skating experience in the region. With holiday decor, plenty of music and a whole lot of people having fun, Tim and I found it the perfect place to start off our date. Tim played hockey as a kid, so he is a natural on the ice. 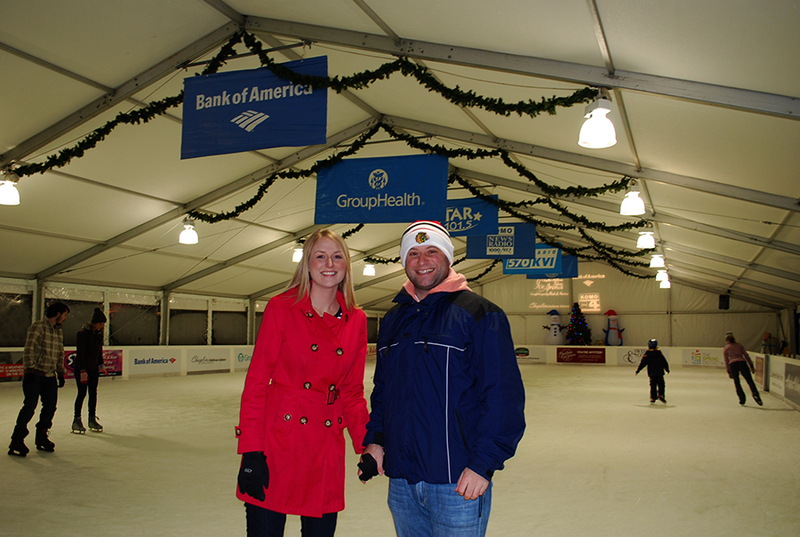 It was fun to have him give me some pointers and skate around the rink holding hands. It felt like we were in middle school again. Admissions (including a skate rental) cost $12 person for adults. Check out their website for times and dates as they vary. After ice skating, Tim and I continued our holiday date night in Bellevue by taking in Snowflake Lane. Every night at 7 p.m. during the Christmas season, downtown Bellevue shuts down for a magical dancing and singing show. Located along Bellevue Way between Bellevue Square and Lincoln Square, the holidays come to life with a visit from the Snow King and Queen, fairies, snow princesses, jingle bell dancers and toy drummers. Christmas music fills the city streets, “snow” (bubbles) falls from the sky, and dozens of performers entertain. The show lasts about 20 minutes and is free to everyone. Arrive early as it gets crowded. There are great views on both sides of Bellevue Way, as well as from the skybridge that crosses Bellevue Way. 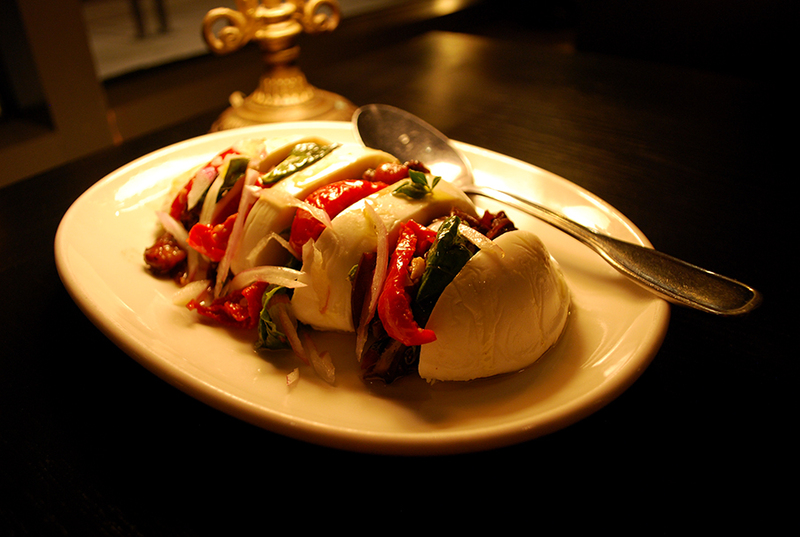 Black Bottle’s eggplant pepperonotta caprese salad with peppers. By the time Snowflake Lane was wrapping up, Tim and I were hungry (and cold! ), so we walked down the street to Black Bottle Postern (919 Bellevue Way NE). Dubbed as a casual gastrotavern, Black Bottle was the perfect next stop on our holiday date night in Bellevue. Rather than order off the menu, we were lucky enough to be treated to the restaurant’s favorite dishes as selected by chef Brian Durbin. Our meal included a butter lettuce salad with pomegranate and goat cheese; eggplant pepperonotta caprese salad with peppers; Mirada half-dozen fresh oysters; Painted Hills short ribs with a malbec glaze and oyster mushrooms; and a bourbon sauced bread pudding. Every dish they brought to us was better than the last. We didn’t have a single bite that wasn’t delicious and perfect. Our incredible meal was paired with a few of Black Bottle’s specialty cocktails, including the Major Danger, Basil Ziniber and Throwback Manhattan. Plates are reasonably priced, small and meant for sharing. It was just what we were looking for. We wrapped up our holiday date night in Bellevue at the Garden d’Lights at the Bellevue Botanical Garden (12001 Main Street). 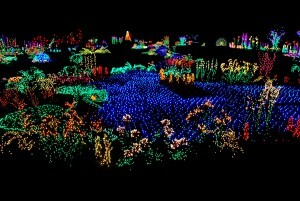 Garden d’Lights is one of the most impressive light displays I’ve seen. During the holidays, the garden is transformed into an amazing winter wonderland with more than half a million lights. The displays create three-dimensional flowers, plants and animals, including peacocks, frogs, and monkeys. They actually give you a list of all the critters in the garden for a fun scavenger hunt. We had a blast trying to find all of the creatures throughout our visit. 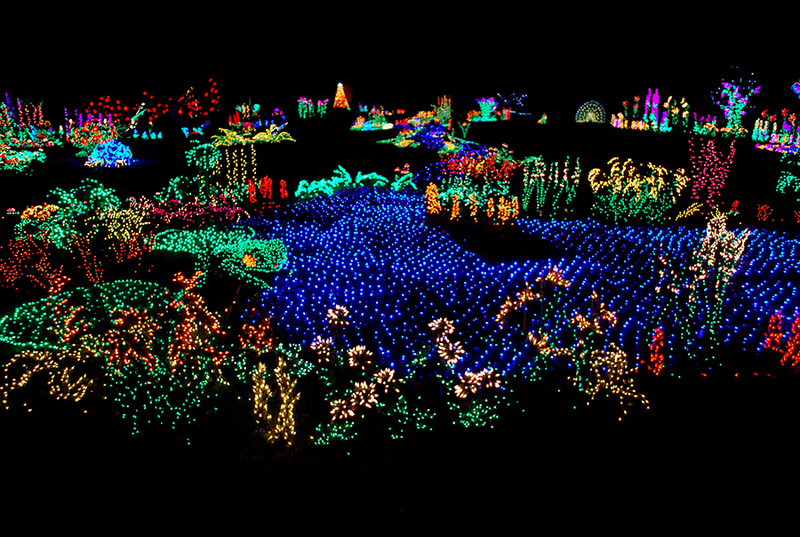 Garden d’Lights is open daily from 5-10 p.m. (last entry is at 9:30) and costs $5 per person. Now that you’ve read our post, do you agree that Bellevue knows how to get in the holiday spirit? 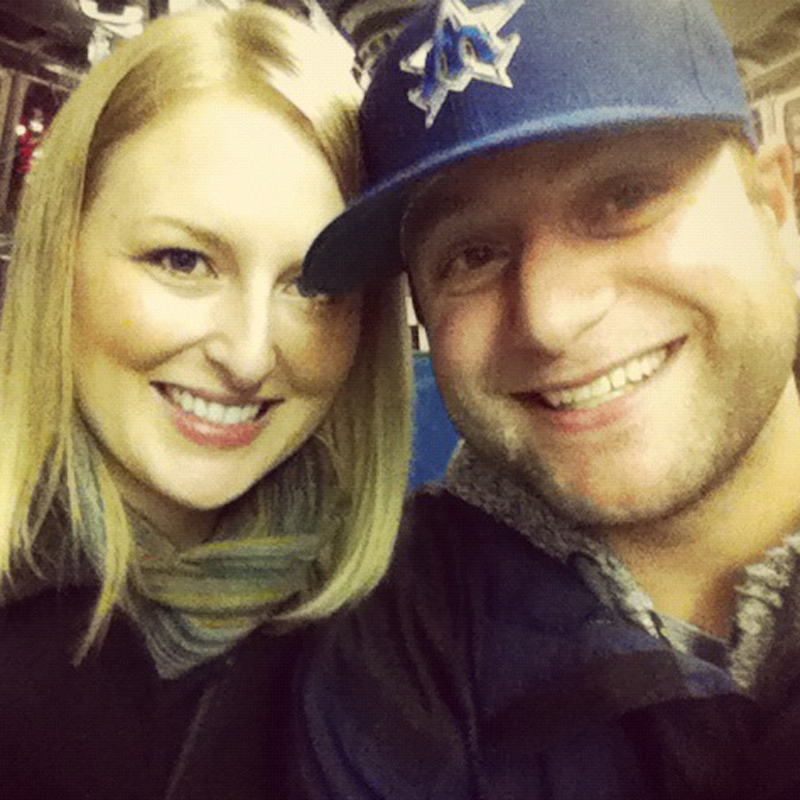 From start to finish, we had such a fun time on our holiday date night in Bellevue. We highly recommend any and all of the stops we made along our date. It’s a perfect opportunity to get excited about Christmas with your special someone. Where the night takes you after that — we don’t want to hear about it. 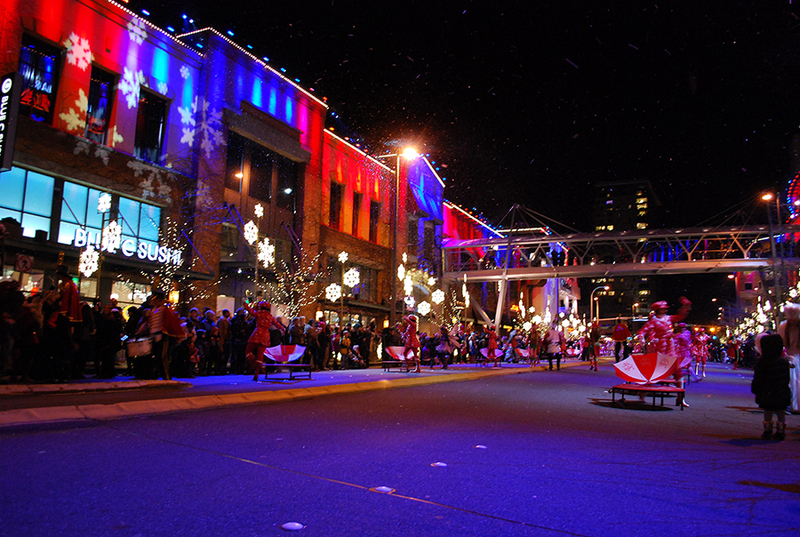 Have you ever taken in the holiday spirit in Bellevue? What did you think? We’d love to hear from you! Please leave a comment below or connect with us on Twitter, Facebook, and Google+. Don’t forget to also check out Seattle Bloggers for more It’s a Date! ideas and much more. Cool! Will surely visit Garden d’Lights.